Description – The video begins inside a conference room at Penn State Children’s Hospital. Two people are standing next to each other. Standing from left to right is Scott Gilbert and Tracy Johnsen. Scott Gilbert – From Penn State Health, this is Ask Us Anything About Volunteering at Penn State Health Milton S. Hershey Medical Center. I’m Scott Gilbert. Well, happy National Healthcare Volunteer Week. That makes it a great time to talk about the wide variety of volunteer positions here at the medical center, and they meet a wide range of interests, skills and backgrounds. And we might even help you learn how you might fit in here at the medical center with your volunteer work. Here to help us do that is Tracy Johnsen. She’s Manager of Volunteer Services here at the medical center. Tracy, thank you for your time today. Let’s start by talking about the breadth of work that volunteers do here at Hershey Medical Center. Probably a little tough to quantify, isn’t it? Tracy Johnsen – Oh, definitely. We have volunteers in at least over 60 different positions and departments throughout the whole medical center, even just here on the campus as well as 30 Hope Drive. We have volunteers that help us out over at the Mulder Senior Center. We recently did an article about their doll making that they do for the facility which is always very well received. Scott Gilbert – Yeah, we’ll link to that here in the comments below this Facebook post. And by the way if you have any questions feel free to add them to the comment field. We can ask Tracy whether it’s live here as part of the interview or even after the fact. But give us a sampling of kind of, again, some of those various volunteer jobs that exist here at Hershey Medical Center. Tracy Johnsen – We have many positions throughout the organization, whether they’re clerical kind of behind the scenes support that they provide to different departments or they’re hands on sort of helping out with patient experience, and not necessarily patient care but patient experience and helping to make the day a little bit brighter for patients and their families while they’re here at the hospital. We have positions in child life, many people often ask about positions over at the Children’s Hospital, and we do have a few positions over there. We have positions in our emergency department. I’m trying to think everywhere, our gift shop of course. Patient experience is a big position here at the hospital that we have a lot of volunteers in as well, pharmacy. Scott Gilbert – And speaking as the person whose job it is to fill all those volunteer positions, what areas are in the greatest need would you say? Tracy Johnsen – Definitely the emergency department is one of those areas that we’re looking to ramp up our volunteer support in. A lot of times that can be an aware where people wait a very long time to be seen, and having some extra support to offer some blankets or pillows or even to sit and chat with somebody who is waiting for a while to be seen that would be a great support for that department. Additionally the gift shop is always looking for support there. A lot of things that people don’t know about volunteering for the gift shop, a lot of times people will say, oh, I worked all my life in retail, I don’t want to help out in the gift shop. Our gift shop, everything that we make at the gift shop comes back to the hospital. Last year in fiscal year 2018 the gift shop gave back to the hospital $272,000 that went to many different programs throughout the hospital. Scott Gilbert – That’s fantastic. Well, I understand you’re also looking for volunteers to assist with way finding. Because every once in a while people can kind of get lost trying to find that room or that appointment. So how are volunteers going to help with that? Tracy Johnsen – Absolutely. We are a very large structure. So when people come into that front door and they ask where to go, and they say go down to the lion, nobody really knows quite where that lion is until they get there. Scott Gilbert – The lion in the rotunda, have you been there? If you can find the lion some people say you can get anywhere. But some people can’t find the lion so that’s what these volunteers will do. Tracy Johnsen – Absolutely. We’re looking for volunteers who feel comfortable to be stationed in strategic parts of the organization to help individuals find their way around because it is such a large place with many different entrances and exits, and trying to find your way around can be very difficult. So having that extra person that can walk somebody to someplace is always nice. Scott Gilbert – Great. And I’m sure there are people watching now who will say, wow, that’s something I could do. Well, we’ll certainly have information for you a bit later and in the comments section about how you can volunteer. 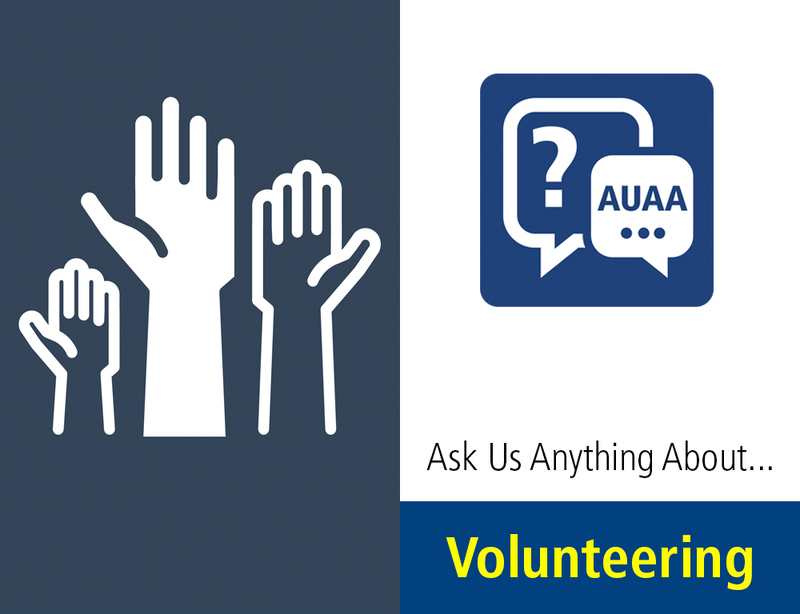 But right now you’re watching Ask Us Anything About Volunteering at Penn State Health, Milton S. Hershey Medical Center. Tracy Johnsen is our Manager of Volunteer Services here. She welcomes your questions and your comments. Just add them to the comment field below this Facebook post and we’ll make sure we get you an answer. I’m wondering, Tracy, what are some of the most popular volunteer positions for which some may even have a waiting list? Tracy Johnsen – We have a couple of those. One of our most popular positions is our NICU called a cuddler position. We get a lot of requests about people who are interested in coming in to cuddle with our most vulnerable patients in the hospital. And that is something that there is a waiting list. We do only put active volunteers on that list because that gives us time to really get to know the individuals that we are allowing to go up and spend time with our most vulnerable patients here in the hospital. Scott Gilbert – We want to make sure that we send the right people to each position. Tracy Johnsen – Absolutely, absolutely. We want to make sure that the kiddos are safe. And not that the person would be a bad person, but just that the kids are well taken care of. Scott Gilbert – Makes sense. Are there any seasonal needs in any particular parts of the hospital? Tracy Johnsen – I wouldn’t say seasonal needs. One of our other programs that’s really sought after is our teen summer program. So this year we have 159 teens scheduled to start our program this year. And just to show you how in demand that program is, we opened our application at 3 p.m. on March 1st, and we had to close it at 3:07 p.m.
Scott Gilbert – On March 1st? Tracy Johnsen – On March 1st, yes, in seven minutes. We were prepared to take about 90 applications, and we received 111 in seven minutes. So that’s one of those really — it just goes to show what an awesome program we have here for the kids and what a great community we have that want to give back to the organization and to the community. Scott Gilbert – That says a lot about the community and about the positions. What are some of the things that the teen volunteers get to do here? Tracy Johnsen – We have teen volunteers in a number of different positions. A lot of them help out in food services. But we have positions in patient transport, the gift shop, pharmacy areas, emergency department, so yeah. Scott Gilbert – Cool. And that’s great experience because that could even possibly kind of light a fire of I want to be in healthcare someday with some of these young people. Tracy Johnsen – Absolutely. And I think a lot of people do use the volunteering in that respect to say, hey, I think I might want to be in a hospital. And that gives them a good environmental look at what it’s like to be in a hospital and do they really want to be here. Scott Gilbert – From Penn State Health you’re watching Ask Us Anything About Volunteering here at the Milton S. Hershey Medical Center. Tracy Johnsen is the Manager of Volunteer Services here so make sure you add your questions for her in the comment field below this Facebook post. And make sure you share this Facebook post as well. If you find the information valuable as we hope you do by sharing it you’ll help us reach even more people with this information. And if you know somebody who might be interested in volunteering here why not tag them in that Facebook post? So, you know, Tracy as the person whose job it is to fill all these positions of which I know there are many, tell us a bit about how you pair up volunteers with the positions that are best for them. How do you find the right match for somebody? Tracy Johnsen – Well, I ask — when someone fills out their application the first thing they do is come to an orientation. And we kind of lay it out on the line at the orientation like these are our expectations of volunteers. And then they’ll sign up with a one-on-one interview with me. And we kind of chat with what their goal is, what are they looking to get out of volunteering with us. What brought them to come? Why did they choose us over the many other hospitals and other volunteer opportunities in the community and what their availability is. And we kind of go from there. Whether or not they want patient experience or if they’re looking to do a little bit more behind the scenes. Scott Gilbert – And when you hear — when you ask that question about what is it you want to get out of your volunteer experience, what are the types of things you hear most often? Tracy Johnsen – A lot of times I hear that they just want to give back. They’ve had an experience in the hospital, whether it was not the best turnout that they were looking for, or maybe it was a great experience and they just want to give back. A lot of volunteers feel that they almost have like a debt to pay back to our organization for the support and help that they’ve given to their family. Scott Gilbert – That’s fantastic. And as for how to spot a volunteer I know many of them wear the famous vest, right? Tracy Johnsen – Yes, there is the famous vest that all our volunteers wear. Scott Gilbert – Like a white and blue and white stripes on that, right? Tracy Johnsen – It is, it is. We are looking to possibly change that in the near future. Scott Gilbert – That could be news for another day then. All right, fantastic. So I’m wondering if somebody comes here to volunteer some people may say I want to interact with people. Some people say I’m a little more of an introvert. Are there things I can do behind the scenes? So is that part of the matching process? Tracy Johnsen – Absolutely, absolutely. We have some clerical support positions that are kind of behind the scenes but you’re still part of our organization. You’re still part of — you know, we all attended a meeting as managers not long ago over out at Spooky Nook, and I believe it was Dr. Hillemeier who had mentioned about the gentleman who went to I guess it was — President Kennedy went to NASA or something and saw the janitor and said what are you doing? He said, sir, I’m putting a man on the moon. And I like to feel that volunteers are the same way. We may not be the ones that are in research labs, and we may not be the ones right there with the patients, but we are helping to create that cure and helping to make healthcare better for people in our community. Scott Gilbert – And National Healthcare Volunteer Week is a great time for all of us to stop and say thanks to those folks in the vests around our hospital who do so much and truly are involved in so many different aspects of the operation. I’m wondering, Tracy, what do you hear from volunteers after they’re here for a while? Like why do they keep coming back? Because some of them truthfully have been coming here for years if not a matter of decades. Tracy Johnsen – Our longest standing volunteer has been here 48 years. She started right after the hospital opened. She just turned 95. She has been volunteering in the gift shop a lot of that time. And her main reason for coming back is it gives her a sense of purpose. It gives her a reason to get up in the morning. She feels good about what she does here. And that’s pretty much where everybody comes from. They learn so much, they’ve made friends, they feel needed and they are very much needed. Scott Gilbert – Absolutely. They play a vital role here. I’m wondering if there are misconceptions people might have when they may believe maybe I’m not a good fit for a volunteer at the medical center. Are there misconceptions people hold about that? Tracy Johnsen – I don’t think that they — I think like some people probably worry on whether or not they’ll get sick when they come to the hospital. Or that being a level one trauma center they might see something like they’ve seen on Grey’s Anatomy while they’re, and that might not necessarily be the case for them. Scott Gilbert – Like you said it’s a big place and there’s a lot going on here besides the things like that that they may not want to see. Tracy Johnsen – Absolutely, absolutely. Scott Gilbert – What range of time commitments are involved in volunteering? So do you need to have a certain amount of time that you can set aside, or is it for a range of time budget? Tracy Johnsen – Well, it is for a range of time budgets. We do ask that volunteers at least commit to 100 hours. Scott Gilbert – Per how long? Tracy Johnsen – We say pretty much within the first year which comes out to about four hours every other week for a year. The reason we ask for that is because there is a pretty cumbersome onboarding process for new volunteers, and there is a lot that we put into that. So we’re looking for people who really want to be here and are really willing to make that commitment to helping our organization. Scott Gilbert – From Penn State Health you’re watching Ask Us Anything about Volunteering here at the Milton S. Hershey Medical Center. Tracy Johnsen our Manager of Volunteer Services welcomes your questions and comments. Just add them to the comment field below this Facebook post and we’ll make sure we pose those to her. I’m wondering how you help people juggle their volunteer work with other time commitments. I mean are flexible schedules available to account for the fact that there are other things going on, too? Tracy Johnsen – We do. We have some things that we call like special projects. So when special things come up right now they’re selling raffle tickets for Tisket-a-Tasket for the Children’s Miracle Network upstairs. We also get different events that come up throughout the year that we have volunteers that kind of come in on a one-time basis as those are. And then also the Ronald McDonald’s family room is a very flexible schedule as well. Scott Gilbert – Great. What types of clearances are needed. If someone wants to work here as a volunteer what kind of clearances might they need to do so? Tracy Johnsen – We require the Pennsylvania State background check, the past background check. And then there’s also the child abuse history clearance through Child Line as well as the FBI fingerprint clearance. Scott Gilbert – All necessary steps. So if somebody is watching this thinking, wow, I didn’t realize there was so much to do, so much going on there, I want to get involved, how can they do so? Tracy Johnsen – Well, if you go to our website you can fill out an application online. And on that application there will be dates for upcoming orientations. And at that time you’ll select your orientation date. And then come and we’ll go from there. Scott Gilbert – Very good. Well, Tracy Johnsen Manager of Volunteer Services here at Penn State Health Milton S. Hershey Medical Center thank you so much for your time today. We hope that this discussion during National Healthcare Volunteer Week has possibly sparked an interest in you to look into volunteering at the medical center. And if so be sure to check out that page which we’ll also link to from the comments section below this Facebook post. Thanks so much for watching Ask Us Anything About Volunteering at the Milton S. Hershey Medical Center from Penn State Health.